Shyamdas was born in America and went to India in the early 1970s to meet the saint Neem Karoli Baba. His devotional practice developed under the tutelage of his guru, His Holiness Goswami Sri Prathameshji, then head of the Pushti Sampraday Pratham Peeth. Shyamdas writes and translates literature on the Path of Grace while searching for the divine moods and visions described by the Gopis in Ecstatic Couplets: The Yugal Gita. All sentient beings strive to make the most of each moment; they optimize the time they have in the hopes that it will produce something worthwhile. Even trees grow with the expectation of achieving their own version of fulfillment. Diversity arises in this world as everyone and everything tries to find its own unique place. As individuals, our experience of the world is colored by our myriad expectations of the possibilities available to us, depending on our varying levels of ability to see them. We are governed by what we prioritize. Yet no matter what we do, we cannot escape the reality of the present moment, which so often presents a reality that differs from our own projections. For some, the world is filled with uncertainty; fear is their foundational mood. Some chase their own particular cravings within a world of infinite possibilities. Other, developed beings discover oneness intertwining with diverse realities. One has simply to took around to see the manifold levels of harmony and discord, happiness and dismay, wealth and poverty, wisdom and ignorance. These various attributes mingle and form realities that can appear worlds apart. The Eastern yogic paths as well as other interpretive philosophical and spiritual disciplines throughout the world have been established to guide us through reality toward their own brand of fullness-or even emptiness. In terms of Vedic wisdom, the goals of life are fourfold: to achieve dharma, wealth, fulfillment of desires, and liberation. Some follow dharma paths that come to us through lineages, often handed down from teacher to disciple, while other find their way according to their individual perceptions. Tempered by time and circumstances, the possibilities are virtually unlimited, as beings establish themselves within a world that they understand through their own inner sense of reality. Some see the world as an impermanent illusion; others, as a place of retribution; while still others believe in only its physical manifestation. Some seek total absorption into the infinite, where all sense of individuality is dissolved into universal consciousness, while other faithful souls seek a personal Beloved who is the source of all things. Others pray to the spirits and entities to get their work done. It does not matter if you meditate, practice yoga, chant, pray, follow your own unique path, or claim to do none of the above, your search will still continue. In this “master game,” everyone steps up to bat at the home plate of reality, trying to score his or her own version of a run. Seekers since time immemorial have contemplated the basic question, “What are we doing here?” In fall 1972, at age nineteen, I left New Haven, Connecticut, as such a seeker and traveled to India, where I made a pilgrimage to Vrindavan, the land of Lord Krishna, to meet the renowned saint Neem Karoli Baba. After Maharajji, as he was known, left his physical form, additional blessings brought me to the Path of Grace, the Pushti Marg. A highly respected senior guru of that lineage, His Holiness Goswami Prathameshji, taught me the intricacies of this grace-filled devotional path for the following eighteen years. Thus far, I have spent half my life in the Vrindavan area, in “God’s playground,” one hundred miles south of Delhi. The holy land of Vrindavan is filled with devotional yogis and has produced an amazing body of literature that relates the activities of God and the saints. I discovered early on that yoga is about first developing an interest and then understanding the sublime relationship between the individual and God, called Brahman in Sanskrit. The world is the stage for this relationship, so I figured that as long as I am here, I might as well become a devotional yoga researcher. Thirty-eight years into the program, I am still exploring the sacred realms, absorbing the teachings of various saints and practitioners and contemplating the relevant devotional literature, written mostly in Sanskrit and Braj Bhasha. Through these associations, I have tapped into sacred resources and now translate my findings into matter that nourishes my soul and heightens my affinities toward infinity. I also ask, “May my work here be of benefit to others.” I am always refining my request because when you can phrase it well, you will get it! So we must think carefully about what we really want. Yoga, with all its amazing limbs, is ultimately about being yoked to God. To ask for anything less is a distraction, and that is what the Ecstatic Couplets teaches us: to desire the Beloved Lord with all your heart. When you hanker after what is either mundane or self-centered, you severely limit your possibilities. Wisdom is about refining the present moment so that what you seek and see are exalted. The singers of the Ecstatic Couplets, the dairymaids of Vrindavan, the Gopis, are really the supreme gurus of knowing what to ask for. They are the devotional yoginis, and while sitting in their homes they constantly remember God so clearly and intensely that He responds by ushering them into His presence. Their path of grace-filled devotion to the Beloved transcends every traditional approach. Their direct dialogue with Lord Krishna is what drew me to their Ectatic Couplets. The Beloved, God Himself, relates to the Gopis individually and dances to each of their songs as they enter the playground and become His partners. They pass their days singing kirtan, songs of praise full of sublime passion. They sing about their Beloved’s lilas, His delightful plays-enlightenment full of form and movement-and their place in them. Their unique experience of God swells within their souls and the nectar overflows into creation. They desire Lord Krishna with such intensity that they literally force Him out of their hearts and into their physical world, drenching everything with His presence. His face and form appear everywhere, and anyone who understands their song becomes attracted to Him. I know there is more joy in separation than in union. In separation, He is everywhere. Divine longing purifies the soul; worldly anxiety obstructs both worldly pursuits and spiritual aspirations. Mundane concerns block yogic perception. Ignited souls deal with this situation by incinerating whatever is unrelated through exalted aspirations. My years in India have taught me to seek ignited company, to associate with blessed beings who inspire me to remember God-to listen to their words, emulate them, engage them, and pray that they engage me. Exalted association may always be found in devotional literature, and lovers of God hold the Gopis’ songs, particularly their Ecstatic Couplets, in the highest esteem. In this volume, we receive the Gopis’ association through their utterances. Their words are considered mantras, spoken in a samadhi (trace) language; their songs inspire even God. They express the ineffable while engaging directly with the Beloved, who resides within and outside everything, unchanging yet playful, constant and caring. Untouched by time, the Gopis’ Lord plays with them. They have been chosen. Because the Blessed Lord is neither born nor dies, those who attain a relationship with Him acquire His attributes of liberated form and eternity. The Gopis, the yoginis of love, bathe in the ocean of liberation and then reemerge to taste, with purified awareness, a world comprised purely of God. Their story grants us entrance into their connection with the Absolute, who, with his smile like a necklace, returns to them in the late afternoon, blissfully fatigued and casting his spell upon them. Their reactions to God’s presence and their expectations are the subjects of the Ecstatic Couplets. Twelve different types of Gopis sing the Ecstatic Couplets, one couplet for each hour of the day. Each Gopi transmits her particular kind of exalted, grace-filled devotion, which is void of the mundane and filled with divine virtues. 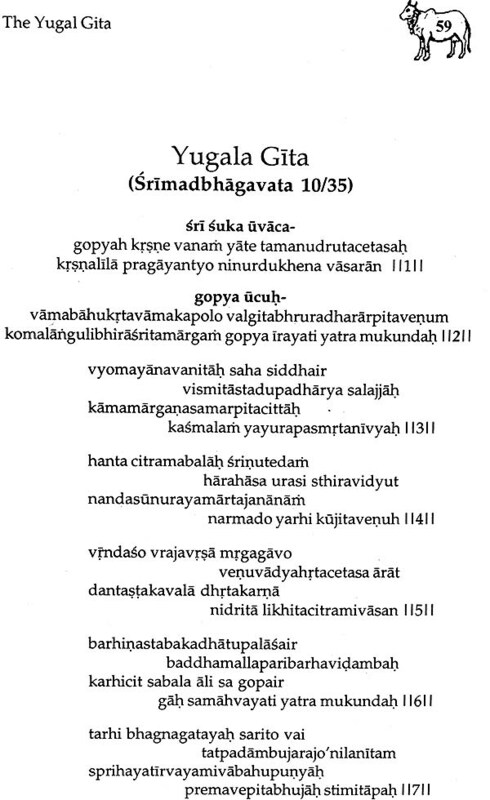 In hopes of finding but a grain of sand that lies along their path, I have undertaken this translation of the Ecstatic Couplets, the Yugal Gita found in the first half of the tenth canto of the Srimad Bhagavatam. 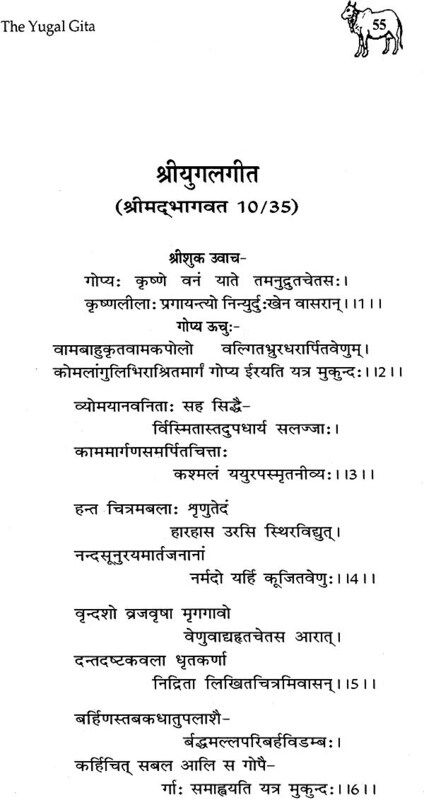 I have also folded into this text its Sri Subodhini commentary, “The Granter of Exquisite Awareness,” composed by Sri Vallabhacharya (1479-1531), as well as some insightful notes called the Tippani, written by his illustrious son Sri Gusainji (1516-1586). Taking Narada’s advice to heart, Sri Veda Vyasa entered into a state of samadhi, and with a showering of grace he beheld Sri Krishna’s Vrindavan lilas with the Gopis. Afterward, he brought forth the Srimad Bhagavatam, wherein the Ecstatic Couplets are found. Sri Vallabhacharya, who is seen as an incarnation of Lord Krishna and His beloved Sri Radha as well as a witness to their plays, appeared to teach the Path of Grace, the Pushti Marg. He expresses his inner devotional views in his Sri Subodhini, which is considered the ultimate commentary on the Srimad Bhagavatam and reflects the bhakti master’s devotional heart as well as the lila psychology of God and His followers. Through his teachings he bestows nondual consciousness that overflows with devotion. He is not only the Gopis’ spokesperson but also, in his divine form, their leader. He brings out the inner nuances of the Gopis’ song, and his words awaken bhakti, the yoga of devotion, and reconnect souls who hear, remember, and recite his teachings. When the Gopis sing the Ecstatic Couplets, they have already tasted God; they have danced with Him and enjoyed His intimate company. Now, they return home to spend their days remembering the Beloved. His form has been impressed upon their hearts with loving devotion fortified by wisdom, and their inner reality floods with God consciousness. They constantly seek the nectar they experience with their Beloved Lord in the world but for now taste it only within their souls. Their condition of separation in union creates a song illuminated by awareness, full of passion yet nirguna –an enlightened condition that transcends material virtues but is replete with the Beloved’s attributes. Although each Gopi has a unique constitution, they are all established in a state of pure consciousness free from any blemish that arises with karma, time, or individual nature. Their song defines grace, and their utterances are revered in the world of practitioners. A good story holds our attention long after its telling. Devotional literature of this magnitude is not teaching us how to attain but rather is defining the attainment. The attraction of the adored subject and the glory of the singers are so alluring that they effortlessly keep the mind focused. The story refines our taste and directs our consciousness to adhere strictly to God. As we imbibe the Gopis’ devotional accounts, they progressively become our own, reviving our devotional awareness. One could contemplate the absolute as no different from one’ own self, perfectly luminous, devoid of distinction, but that contemplation becomes truly successful when it awakens the devotional heart and makes us remember who we really are: God’s eternal partners. Oneness that obscures lila awareness and homogenizes the self into a state of nonidentity, though considered by many to be liberation, is never the goal of the loving practitioner. Why would she ever want to remove her loving eternal self from the Beloved’s embrace? Experiencing God’s presence transcends impersonal realization and allows the lover of God to experience the joyful reward everywhere. Trying to realize “I am that” generally enhances false identification, as the focus is often on the “I” instead of the “that”. It is difficult for the bound being, full of form, to identify with something totally abstract and devoid of everything. Better than becoming “that” is to humbly become a “das”, a follower of the Blessed One. Being a follower is the true dharma of the soul. The Beloved is not moved by concentration or austerities but by humility. The aim of devotion is simple: serve God and His people. When you please the Beloved with humble service, there is a chance He will appear. Although beyond sense perception, the Beloved arrives with grace in a comprehensible form; then there is entrance into the playground. When loving devotion ignites the soul, the One who resides in all things at all times, beyond the effects of karma, becomes totally recognizable –that is the Gopis’ message. 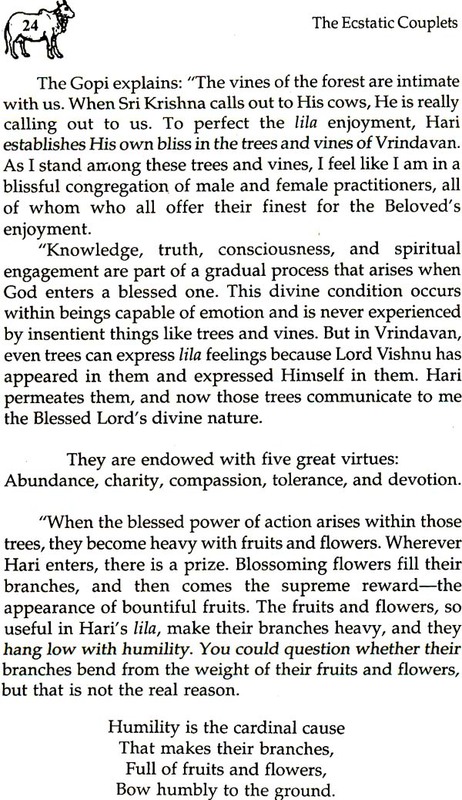 The experience of arriving face to face takes place in Lord Krishna’s lila land, where even the trees feel His presence. There, in lovely groves where every season is perfect, the Beloved sports with the yoginis of love. The Gopis, the gurus of devotion, empower us through their Ecstatic Couplets to see the Govardhan Hill, covered with shining jewels, and to hear the parrots, peacocks, and swans serve the Blessed Lord with their songs. Gopihood allows us to glimpse Vrindavan alive with a host of enlightened beings engaged in serving the lila. The Yamuna River becomes a current of love gushing from the nectar heart of the primal Narayan, flowing unceasingly toward Blessed Krishna. Gopihood makes everyone and everything intoxicated with an enlightenment that engages those who have been liberated from liberation as well as from all other forms of false identification generated by the deluding forces of maya. Lord Krishna never tires in love. He is full of joy and arrives in this world to bring His intimate one home. He comes with a retinue of lila beings. When everything is in place, He enters and plays with a combination of names and forms and appears human for the sake of recognition. When we awaken to the possibilities of the Beloved’s invitation, every hankering, even the desire for liberation, ceases to exist, is no longer remembered. This awakened state is not grasped by intelligence but through bhava, the enlightened devotional state of being. It is the driving force in the Beloved’s realm; in order to nourish that devotional mood, associate with those who elevate your loving devotion. The Vedas declare, “Seek the play of God.” See God’s joy in His hands and feet, face and stomach. As we awaken to the possibilities of illumination, the head bows with uncontrived devotion to the Beloved’s feet, the abode of refuge. His blissful response may be felt in the external world, as it is by the Gopis. They recognize His presence in the deer, cows, and birds, while Lord Hari, who delights in His own self, wanders the inner realms. The Beloved’s lila is always expanding in joy and is known through love alone. 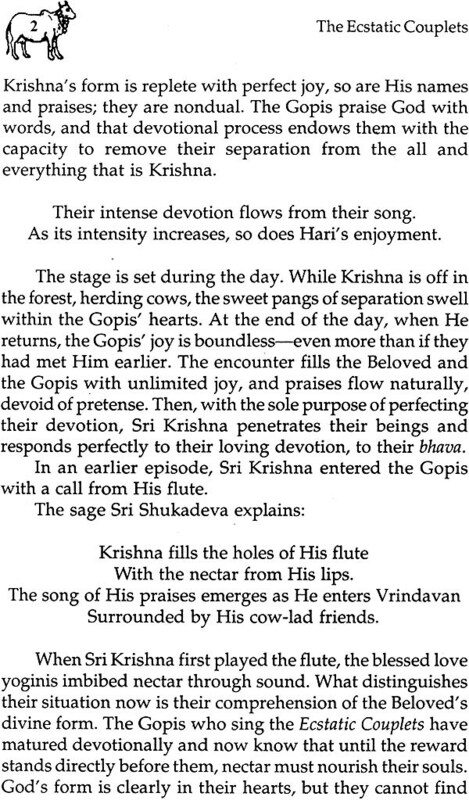 The Gopi singers of the Ecstatic Couplets bring us to the lila stage; Sri Krishna appears in this realm, where everything is God and nothing but God. He is in every tree, residing within every leaf, playing the flute and sitting joyfully with four arms. When the soul becomes connected to its true self, it discovers the foundations of its spiritual being and its connection to infinity and can then remove the blinding brilliance that conceals the Lord and behold His face. We, too, may delve into the joyful lila sequence, but remember: the illuminations found in the Ecstatic Couplets arise not through discussion but only when ignited.